To make war all you need is intelligence. But to win you need talent and material. Col.Gen. Harold Moore and Col.Gen. Nguyễn Hữu An returned to the old battlefield, Oct, 1993, exchanging their diaries, maps, operational notes, memories and friendship. The IaDrang Campaign was to the Vietnam War what the terrible Spanish Civil War of the 1930’s was to World War II – a dress rehearsal. The place where new tactics, techniques and weapons were tested, perfected and validated. In the IaDrang, both sides claimed victory and both sides drew lessons, some of them dangerously deceptive, which echoed and resonated throughout the decade of bloody fighting and bitter sacrifice that was to come. While those who have never known war may fail to see the logic, this story also stands as tribute to the hundreds of young men of the 320th, 33rd and 66th regiments of the Peoples Army of Vietnam who died by our hand in that place. They, too, fought and died bravely. They were a worthy enemy. Wild flowers now grow in those places of violent death. The IaDrang from PleiMe west is uninhabited except for a few montagnards who are/have been driven out to the east near PleiKu. The Ia Drang/Chu Pong area is now known as The forest of Screaming Souls ⓶ and remains mysterious and beautiful. Hoa dại giờ mọc đầy trên mảnh đất từng đầy rẫy chết chóc. Vùng IaDrang đến giờ vẫn không có ai cư trú, ngoại trừ một vài sắc dân miền núi đang được di dân về hướng đông gần PleiKu. IaDrang, ChưPrông nay được biết đến với cái tên Truông Gọi Hồn, vẫn nguyên vẹn huyền bí và đẹp đẽ như tự ngàn xưa. ar, 1965, the first U.S troops arrived in Vietnam (Danang). 8 months later, their first major engagement with the VPA in a large battle (of regimental, divisional size) took place at the Valley of IaDrang, which is since then known as the Valley of Death. Feb, 1994, President Bill Clinton announced the normalization in relationship with Vietnam. In an action to bootstrap of the process, in 1993, a film was made featuring the old bloodshed battle of IaDrang. Thus, battle of IaDrang marks the begin and end of a long-time painful and bitter relationship between the two nations. Up to the present days, lots of people from both sides still can not get it right about what had really happened then and there. The story below tries to recall the truth. 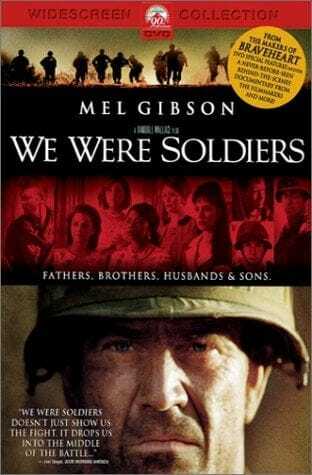 But first, about the film: We were soldiers is based on We were soldiers once… and young, a book written by Harold Moore himself, as one of the direct commanders in the battle (on the American side). It’s a Randall Wallace‘s film, the famous director of Brave Heart, Pearl Harbor, and now We were soldiers, with Mel Gibson as Lt.Col. 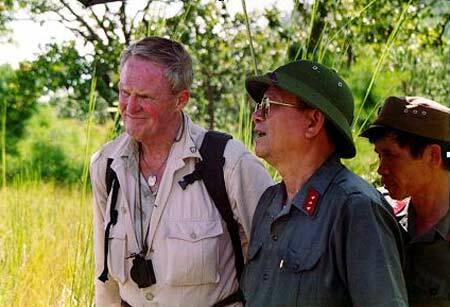 Hal Moore, and Đơn Dương as Lt.Col. Nguyễn Hữu An. To my disappointment, the film is no better than any other Hollywood’s films such as Black Hawk Down, solely made to demonstrate American heroism. Exactly as written in Harold Moore’s book: Hollywood got it wrong every damned time, whetting twisted political knives on the bones of our dead brothers . The film is no exception, it takes many of the small facts of the book onto it, but only to falsely portray the historical events. In fact, the film is a distortion of facts that happened, of peoples involved in the battle, especially the figure of Lt.Col. Nguyễn Hữu An. In a sense, the film has undermined the author Hal Moore’s (and many other American veterans) sincerity and goodwill. Hal Moore is also a man of literature talent, the following line is written upon his revisiting the old battlefield, 1993, accompanied by general An, about the battle and his old enemy (column on the left). Strictly speaking, Lt.Col. Harold Moore was not the corresponding counterpart of Lt.Col. Nguyễn Hữu An, he was one of the three direct commanders in the battle, a battalion under Thomas W. Brown. Nguyễn Hữu An was then the division commander of the 325th. But history has brought the two man into one battle and a rendezvous aftermath. Battle of IaDrang was actually two main battles in an operation which lasted for one month (between American 1st division and VPA’s 320th, 33rd and 66th regiments). The main confrontations were at the X-Ray and Albany landing zones, between the 1st, 2nd, and 3rd battalions of the 7th cavalry regiment of the U.S army with the 7th, 8th, 9th battalions of the 66th regiment (and one company of the 33th regiment) of the VPA. Hence, in formations’ numbers, the two sides have equal forces. Contrary to many many sources, Lt.Col. Nguyễn Hữu An did not have any advantages in power comparison, even in number of man. All his infantry battalions are light-armed units, with just some mortars. On the adversary side are air assault and air mobility cavalry units, with superior fire power support. From the air, an average number of 300 sorties per day was made, with all available air units in south Vietnam, and on land, field artillery came in heavy use. So the ratio here is at least 3:1 with the weaker is the Vietnamese side. Some sources give intentionally wrong information like: the landing troop of 400 man was surrounded by 4,000 soldiers, in fact, 4,000 was number in the whole area (not each individual landing zone), in the same way, we can say: two VPA regiments confronted with forces of the 1st division (a typical American division has at least 20,000 personnel). The battle witnessed extreme uses of fire power: for the first time in history, strategic bombers B52 are used for tactical roles, air mobility by helicopters reached the highest level ever since the start of WWII. The VPA learned that they could neutralize the effectiveness of that fire power by quickly engaging American forces at close range, thus turned the battle into a close-quarter struggles with mainly knife, bayonet and other small arms. A series of well-planed ambushes turned the American situation to desperate. Finally, they know that they can not deny or hide an obvious defeat, then dropped napalm bombs to clear all vestiges, sacrificing all, including man of their own. This is known as one of the most savage battle and can be considered as microcosm of the whole war. The American casualties is about 700, the Vietnamese is about 1100, a victory to Lt.Col. Nguyễn Hữu An in consideration to forces participated in the confrontation. The battle set up, for the first time, an example in which a modern Calvary division can be defeated (Calvary division was then a new concept of air assault and air mobility units, formed firstly in the Vietnam war). In fact, the battle is blueprint of tactics successfully anticipated by Lt.Col. Nguyễn Hữu An, many interesting details can be found in his memoir (all details, facts, formations, numbers, estimations… in this post can be confirmed by both 2 memoirs from the 2 sides). He is named: the General of Battles for his exceptional talent in tactical problems. The man is among only a few number of generals in Vietnam who truly gained respect from the people, not only for his success in military career but also for his righteous attitude toward history and moral principles he’s practiced in life. ⓵⏎ Hemingway’s words were true in the Spanish civil war, but it’s not true anymore in the Vietnam war. Even with talent and material, you still can not win it. ⓶⏎ The phrase: The forest of Screaming Souls may have been first introduced in the famous Vietnamese novel The sorrow of war by Bảo Ninh. The author (also the main character Kiên in the novel) was also a soldier in this B3 (Central Highland) front.